I'm not terribly fond of selective colouring so no 'flash of red' photo for me today; instead you get this image of Nightjar Cottage (the doors and windowframes are painted bright red, but you'll have to take my word for that!) and the view to the north. This was taken from the high ground at the edge of the forest about 2 kms from where I live. 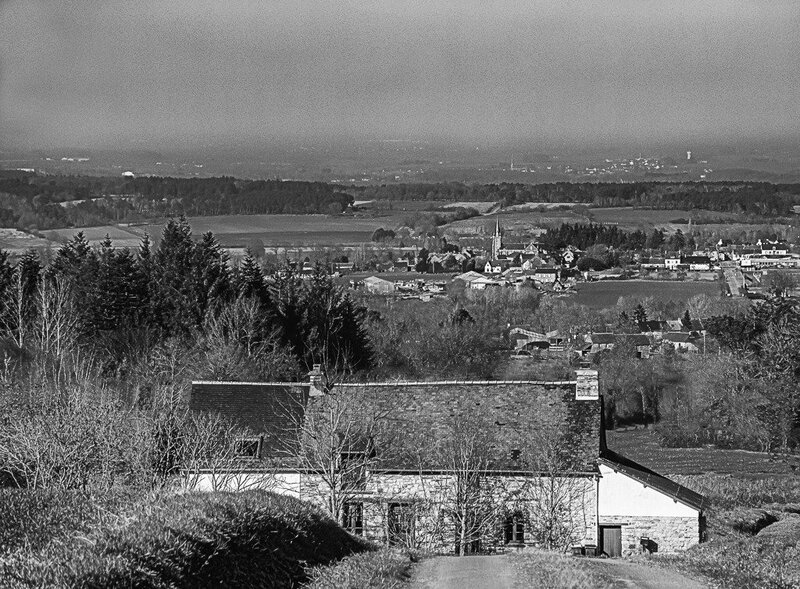 The village in the mid-ground is Concoret, about 3 kms distant; directly north of the church spire of Concoret is a second spire belonging to the church at Gaël about 11 kms distant; the water tower on the horizon to the right is about 12 kms distant: it's not always so clear, so I was pleased to get this. Best on black if you can. Sharp contrasts, lots of texture. Indeed you were fortunate to have such a clear day for this shot. Could have been entitled '50 shades of grey' released today. I like it a lot. I got over "selective color" after about one month of playing with it. Cliché number 15 that I do not admire very much I am afraid. Okay, you have to quit doing this. I get confused easily. Because I know they are read because I saw in your other album and it confused me to find it in my feed again. Not nice to mix up old ladies sleeping at their computers. And Mrs. S. is a clever lady. Another fantastic capture and I love the narritive. Yeh, I'm not a fan of selective color much. I mixed it up a little. What a fabulous scene, unfolding from the road all that way to the distant town. Fantastic shot. I love the layers of interest from the front to the back of the shot. I am not a fan of SC either, but did my first and most likely last attempt at it today. Lovely mono landscape. Nice information too.